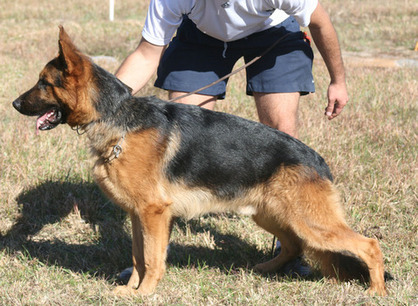 V Zeke vom Eichen Hugel, Sch1, BH, AD, CGC, HD"a", ED"a"
Zeke is the dog that got me started in Schutzhund. Stud services are available to approved females. Chopper (Ryn) is an exceptional young male that is working as a bomb detection dog at the LA Port. Amor placed 3rd at the 2010 USA Sieger Show. He is currently working as a railroad explosives detection dog in Texas.